Chennai Super Kings is been one of the most successful and loveable team in Ipl. Under Dhoni's captaincy this team Won 3 Ipl trophy. After 2 years of suspension this CSK started poor in 2018 but they bounced back in a spectacular way and won the trophy of season 11. 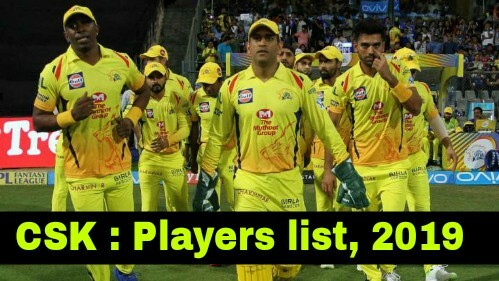 In this season CSK released just 3 player from their team. The defending champion, Chennai super kings tried to grab the most expensive player Jaydev Unadkat, but due to lack of money CSK team franchises couldnot buy him. And Rajasthan Royals snapped him at Rs. 8.40 crores. But in the pace bowling department CSK's spine Mohit Sharma made comeback as the team franchises bought him at 5 Crore. Mitchel Stanner who missed the previous session due to injury, has been retained. MS Dhoni (Captain) , Suresh Raina, Deepak Chahar, KM Asif, Karn Sharma, Dhruv Shorey, Faf du Plessis, M Vijay, Ravindra Jadeja, Sam Billings, Mitchell Santner, David Willey, Dwayne Bravo, Shane Watson, Lungi Ngidi, Imran Tahir, Kedar Jadhav, Ambati Rayudu, Harbhajan Singh, N Jagadeesan, Shardul Thakur, Monu Kumar, Chaitanya Bishnoi. The three players who have been released from CSK in this season are - Mark Wood, Kanishk Seth and Kshitiz Sharma.